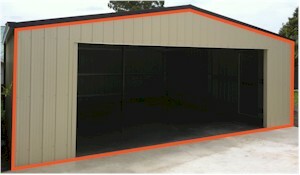 On this page we outline terms often used in the shed industry. The purpose of this page is to provide you with some basic information to assist you in making an informed choice when you receive your quotations. If you have any questions, please don’t hesitate to contact us and we’d be happy to assist. Wind design speed is measured in metres per second (m/s). Every site needs site specific wind speed to determine the required building strength and steel specification. This refers to “on the fly” instant engineering calculations by the design software – to suit the input of the wind design speed. This refers to a building with a pitched roof design. This is the Lysaght name for “square rib” type sheeting with 4 * pans. This is the name for the traditional style round rib sheeting. Also known as Custom Orb by Lysaght. The gable walls are the ends which show the roof pitch or highest point of the building. 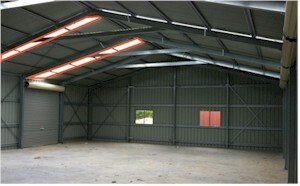 The span is the width of the building. 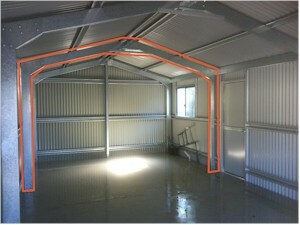 This is the direction the rafters “span”. This is the length from one gable end to the other gable end. The side and direction the gutters run and the ridge line. This is determined by the number of bays and bay lengths. Apex refers to the top of the roof also known as the ridge of the roof. This is the highest point of the building. The roof pitch is the degree at which your roof falls from the apex to the gutter. Rafters create the roof frame and are a beam that run from the apex to the gutter supporting roof purlins that the roof sheeting fixes to. Columns are a structural component running from the slab to the rafters supporting the roof and walls. These determine the wall height of the building. Knee joints (Haunch) are the point where the column and rafter are connected using a knee plate. 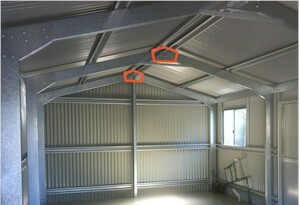 Apex joints are the point where the rafters are connected with an apex plate in the apex of the roof. These are the brackets that fix the columns to the slab. They can be an embedded type fixed into the concrete – or fixed to the finished slab after pouring – using masonary anchors. Portal frames are the completed frame consisting of both columns and both rafters bolted together at the knee joint and apex joint. 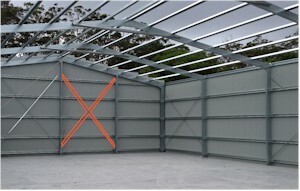 The bays are the distance between one portal frame to the next e.g a shed with a length of 12m may consist of 3 * 4m bays. 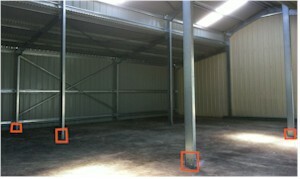 The height of the building is the measurement from the bottom of the column to the top of the eave purlin. IE. From the slab to the underside of the roof sheet at the outside. 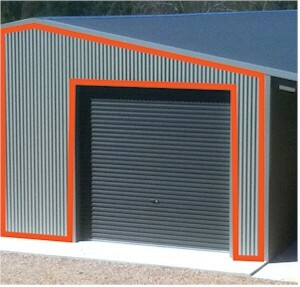 Note: A barn height is determined by the measurement from the bottom of the column to the eave purlin of the centre part of the building, extra height will be needed to allow for the drop and roof pitch of the side awnings. 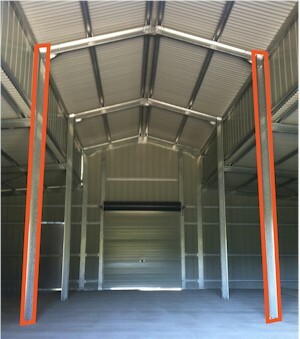 Clear span is the dimension across the building width from one column to the opposite column without any supporting posts to the rafters in between. What is the maximum clear span? 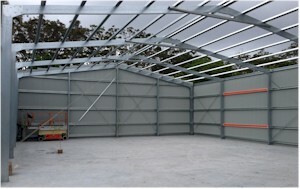 The maximum standard clear span of our steel buildings is 24m using C Section designs. 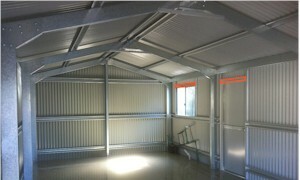 Structural fabricated style buildings using heavier I beam type framing and web trusses can achieve much bigger spans. 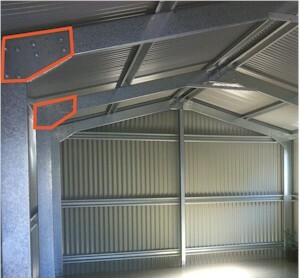 Purlins are the metal battens or Zeds that are fixed on top of your portal frames. These are what the roof sheets fix to. Running the full length of your building, the eave purlin provides a point to fix the wall and roof sheeting. Girts are the metal battens that run on the outside of the portal columns supporting the wall sheets and strengthening the building. Mullions are columns in the gable end walls which share the load with the girts to support the wall sheeting. Door Headers are an additional section running across the top of the opening of a door or window giving additional strength and allowing somewhere to fix the header sheeting to. Bracing is required on every building and provides strength and stability as well as preventing movement. 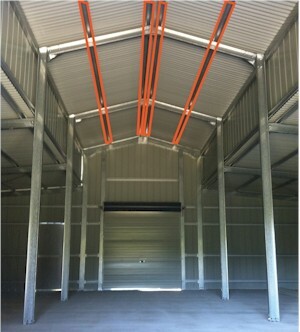 The amount and type of bracing is determined by the wind loading, terrain, location and design of your building. Bracing can be strap type, steel cable or rod bracing types. 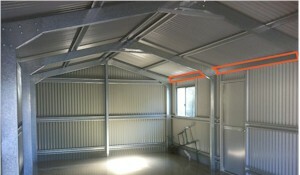 TCT is the thickness of the metal sheeting after it is coated with colour paint. 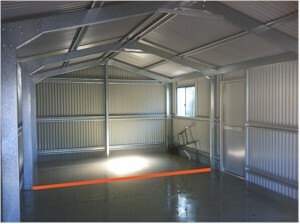 BMT is the thickness of the metal sheeting before it is coated with colour. 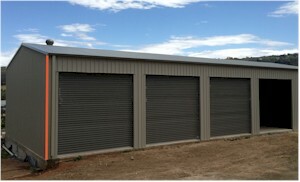 These are a system to strengthen Rolla doors in Cyclonic windload areas. 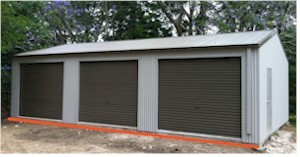 They are now required by law for every RAD fitted to every building supplied into a cyclonic wind zone.These wind lock systems have their own Engineering Certifications. Flashings weather proof your building and cover sheeting to stop water ingress. E.g. Ridge capping at the apex, barge capping and corner flashings. 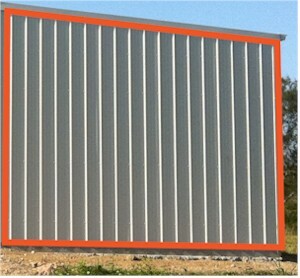 They also cover cut edges of sheeting to give a safer and or aesthetic finish. This is correctly termed a Monoslope roof – meaning a fall one way. 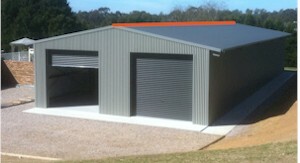 This is often called a flat roof for a carport – but it does have a fall to one end. This is a personal access door – usually supplied as a smooth sheet skin door. These are sheets in the roof to allow light. 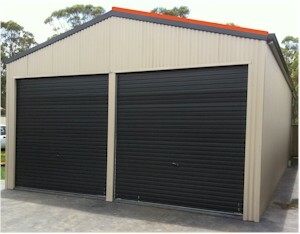 Usually made in fibreglass or poly carbonate these are the same profile as the roof sheet. 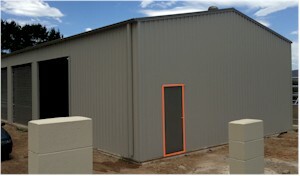 This building has a central building with an awning to each side. The awnings have a dropped height to the main building. 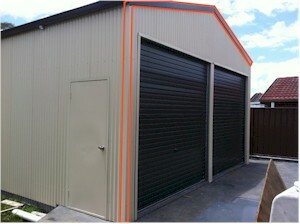 The awnings may be enclosed or part open. 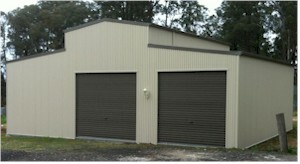 Same as a Heritage Barn – but the awnings are attached at the top of the column height IE No drop height to the awning. 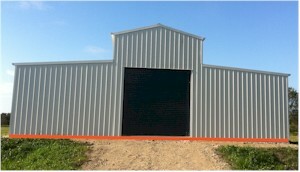 These are supplied as steel stud frame (house frame) style designs. 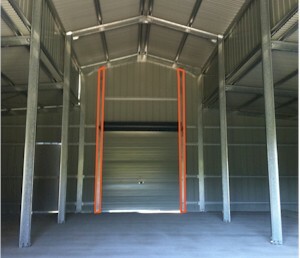 They are ideal for horizontal cladding, internal lining or building on a raided floor system. Tek screw – used to fasten roof and wall sheeting to purlins and girts- roof teks have neoprene washers to create a water tight seal. These are masonary anchors in various sizes. These are used to fix columns, mullions and door jambs to the slab. You need to drill the correct size hole into the slab with a hammer drill. Another type of masonary anchor – stronger than dyna bolts – so used where greater strength is needed. These use short threaded rod studs and two part epoxy chemical to “glue” the stud into the concrete.